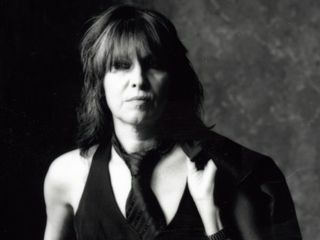 The Pretenders' Chrissie Hynde: "I'm not a tortured artist"
"The first two Pretenders albums were good, but people tend to focus too much on them," says Chrissie Hynde. "Maybe they're just things people need to cling to. They remind them of their youth or something. I guess when the world is as messed up as it is, I can accept that." Or maybe it's that those early records weren't just good; they were special. It's been almost three decades since Hynde and the original Pretenders lineup (which included lead guitarist James Honeyman-Scott and bassist Pete Farndon, both deceased; and drummer Martin Chambers, who continues to play with the band) broke out of London's punk and new wave scene and created an international sensation with their 1979 debut, featuring the hits Brass In Pocket, Kid and Stop Your Sobbing. The drug-related deaths of Honeyman-Scott and Farndon in 1982 and '83, respectively, temporarily derailed The Pretenders, but Hynde eventually put the group back together and soldiered on with a succession of lineups, some better than others, and most featuring Chambers. "Martin and I are like old warriors," Hynde says. "We have each others' backs." Since leaving her hometown of Akron, Ohio in early '70s, Hynde has lived in London, and much of the music she made reflected her transplanted Yank status - there's always been a tacit British sensibility to her approach. In the last couple of years, however, Hynde has gone back to Ohio. She's been spending time with her aging parents, and the longtime vegetarian even opened up Akron's one-and-only vegan restaurant, which has been a huge and unexpected success. Being back in America resulted in a personal musical shift for Hynde, also unexpected. "I've discovered, or re-discovered, my hillbilly roots," she says. This is borne out on the new album Break Up The Concrete, on which Hynde and her latest incarnation of The Pretenders (which includes guitarist James Walbourne, bassist Nick Wilkinson, Eric Heywood on pedal steel, and as usual, Chambers), quake with an authentic hoedown intensity. For the album, Hynde recruited legendary session and touring drummer Jim Keltner, who Hynde says has "more of an American vibe." The redoubtable Mr. Chambers was not only receptive to the idea, he welcomed the challenge of later re-creating Keltner's parts live. "Martin knows he's part of the band," says Hynde. "At this point in the game, I don't feel like going anywhere without him." There's an emphasis on rockabilly and country rhythms on Break Up The Concrete. Was it your intention to make an 'American'-sounding record? "But then I was in the Joshua Tree Park in California, and I wandered about and found the spot where Gram Parson's body was buried. I don't know what happened, but I had a moment. A moment of clarity. The whole theme and direction of the album came to me and I knew what I had to do." You recorded the album very quickly. Was that the plan or did things just happen that way? "The plan was to go in for one day with Jim Keltner and see what happened. Martin Chambers was very happy and gracious to step aside and let Jim work with us - I knew I wanted to explore other rhythms and different feels on the record, and there's a certain feel Jim has that I knew would be right for the project. Jim's been doing this kind of thing for a long time, playing on other people's records, and like I said, he has a feel that is uniquely his own - that's what I wanted. Martin's real happy with the record, and now that he has to play the songs live, it gives him a chance to improve his game. Hey, we all want to learn, right? "So we went in with Jim and everything felt great from the word 'go.' We got two songs done in one day and decided to keep going. We burned through the rest of the songs in the next ten days and we had an album. It was just meant to be." "Ray Davies once said to me, 'People like three songs, and then they like a lot of other songs that sound like those three.'" The song Boots Of Chinese Plastic has unmistakable similarities to Tattooed Love Boys - the instrumental section, especially. Were you paying homage to the early Pretenders? "Not really. It's a sound that I just naturally gravitate towards. Actually, the song was partially written right around the same of the first album - I kind of had it in my head all these years." The song You Didn't Have To has the same kind of sweet melancholy of Kid. They could almost go side by side. "Ray Davies once said to me, 'People like three songs, and then they like a lot of other songs that sound like those three.' I know that's how I feel. I like ballads, mid-tempo songs and rockers. I guess I just keep repeating myself. But lyrically, I never sit and think about what I wrote years ago or anything. There's no plan. Whatever comes out is what comes out." Your new lead guitarist, James Walbourne, is a great player. What kind of characteristics do you look for in guitarists? Obviously, you've had some brilliant ones in the band. "I look for someone who has a feel that's similar to James Honeyman-Scott. He's the guy that I invented the Pretenders sound with, so I'm looking for that first and foremost. But I'm also checking out how they look, how they hold the guitar when they're onstage - just the vibe. You can't explain a vibe; you just feel it. James Walbourne has it." Let's talk about your songwriting. Does it come easily to you? Do you have a process? "I can go months or even a year without thinking about songwriting. I'm not very ambitious. Songwriting isn't my life; it's just something I do. It was a way for me not to be a waitress. [laughs] So when I know I have to make an album, I sit down and see what's in my head. That's it, really. No process. I'm not a tortured artist. I'm not even an artist." When you do write, how do you demo material? I imagine you're kind of old school, just a tape recorder and you singing and playing. "I don't even do that. I just remember the songs and play them to the guys live when we're in a rehearsal room. I have my lyrics sheet and chords written down and that's it. I don't know how people work all these computer programs and whatnot for songwriting. If it helps them, great. But for me, I go by memory." You've used a Telecaster throughout your career. What is it that you like so much about it - the feel, the sound? "I'm just used to it. It's a guitar I picked up a long time ago and that's it. I don't know anything about guitars, really. A guitar is just a thing, a tool." One person who did know a lot about guitars was James Honeyman-Scott. Did he have an influence on you as a player? "I don't know if you can actually 'write' a solo; you just play it." "Its really hard to say. James was an incredible guitarist, but I don't know if we rubbed off on each other. He did what he did; I did what I did. It was 30 years ago, you know?" Certain solos and riffs of his have grown in significance over the years. The solo to the song Kid, for example - how long did it take him to write it? "I don't know if you can actually 'write' a solo; you just play it. Again, it was so long ago...He just came in and played it and it worked out." "Look, he was a great player and an important person in my life, but you're asking me to remember something that honestly...I've worked with a lot of great musicians. I have great musicians in my band now. I'm focused on what's going on now." Speaking of now, are there any new bands that excite you? "Not really. I've seen a few bands in the local bars in Akron that seem cool. But I don't pay too much attention. I'm trying to do my own thing and get through the day. That's really what I'm all about now, getting from today to tomorrow in one piece."